Last week, Nike presented the French national team's uniforms for the 2018 World Cup, and today the Swoosh follows up with the Portugal Home and Away Shirts. Take a look at the kits that CR7 and Co. are going to wear this summer. Following the Portuguese success in the UEFA Euro 2016, Cristiano Ronaldo and the rest of Portugal's national team seek to go all the way in the 2018 World Cup. 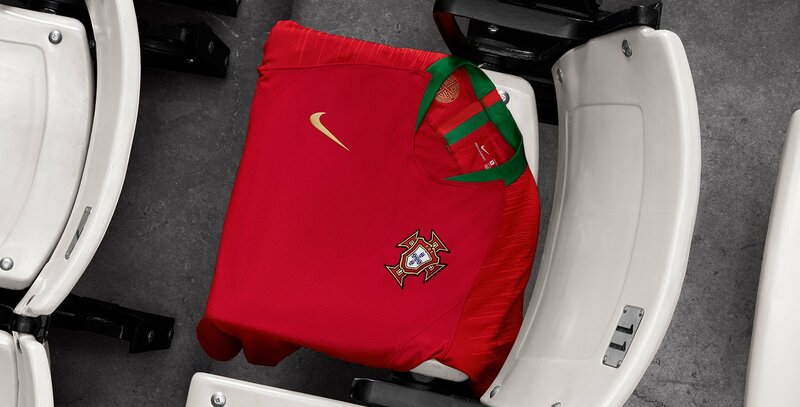 Just like in the Euro, Nike provides the kits for Portugal, and today the brand has released both the Portugal Home Shirt and the Portugal Away Shirt. The Portugal Home Shirt for the 2018 World Cup in Russia combines a red base with gold logos and a green collar. The inside of the neck of Portugal's 2018 jersey features a pride graphic inspired by the country's naval history. The kit is inspired by Nike's 2018 Vapor template, which is seen on the sleeves that are slightly lighter and boast a knit stripe pattern that runs from one sleeve to the other across the top of the arm and upper back. The predominantly white Portugal Away Shirt is based on the 2018 Nike Aeroswift template with solid white raglan sleeves and a subtle zig-zag pattern. Besides that, the away kit features a bold and eye-catching graphic print on the front, which consists of small green crosses that grow in size towards the center of the front, and green-red strip inspired by the Portuguese flag runs beautifully down the back of the neck. Two very simple but classy kits. We can't wait to see the Portuguese team running around during the World Cup in Russia. We can almost sense that the World Cup is closing in with all these kit releases, and we're looking forward to seeing Ronaldo & Co. in their brand new kits. Are you interested in getting your new Portugal kit? Then you can buy the Home Kit from the 23 of March, while the Away kit will be available from the 26 of April.